I have been neglecting this blog for quite a while. Have been busy with repeated bakes, attending workshops and also watching my Korean dramas. All these are pretty addictive. On this public holiday, I have decided to make bread bowl soup for lunch for my children. I like to explore baking foods. I was glad the food turned out pretty well though I would like my soup to be thicker. I guessed I must've added a bit more water. But the overall taste was good. And everyone polished off their bread bowls too! Wholemeal Square Bread Bowls, modified from here. 1. Mix all ingredients (except butter) into a dough using low speed for 3mins. 2. Add in the butter and continue to knead until the dough is pliable (smooth, soft and elastic), about 5-6mins on medium speed. 3. Shape into a ball, cover to rest dough for about 1 hour or double in size. 4. Flatten the dough into a rectangular shape. Divide equally into 8, approximately 140g each. 5. Pre-shape it and let it rest for 10mins. 6. Roll up swiss-roll style and tighten the dough. 7. 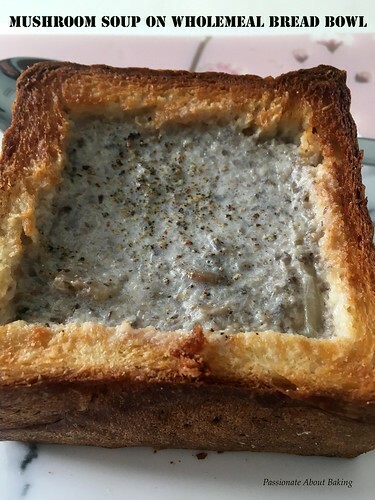 Place 2 doughs into one loaf pan. 8. Cover and leave to proof for about 50-60 minutes. 10. Remove from the mould and let it cool completely before slicing. 1. Heat up a medium pot on low. Add olive oil. 2. When it's hot, add chopped garlic to cook till browned. Add onions and cooked till soft. 3. 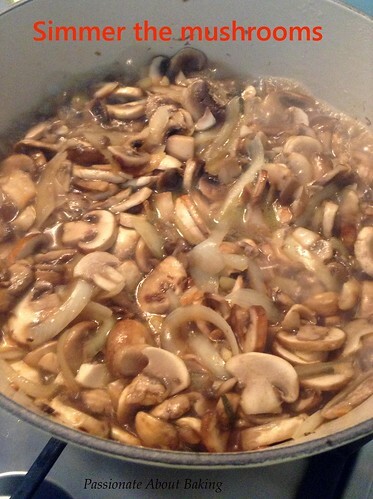 Add in mushrooms and cooked till it reduced to half the quantity, and soft. Turn up the heat to medium. 4. 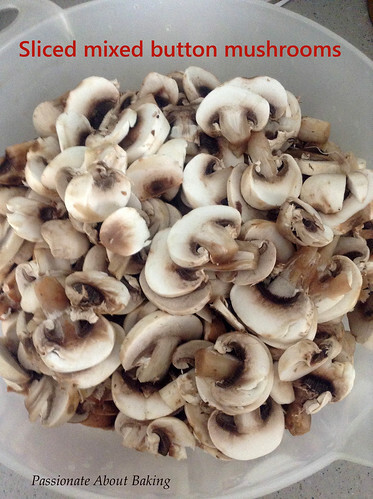 Spoon out 5 tablespoon of mushrooms to keep for later. 5. Add in the water and chicken vegetable stock. Close the lid and let it simmer on medium heat. 6. Lower the fire. Use a handheld blender to blend the soup. Then add in the mushrooms from #4. 7. On low heat, add in the cream, and stir. 8. Simmer and bring it to a boil, then turn off the heat. 1. 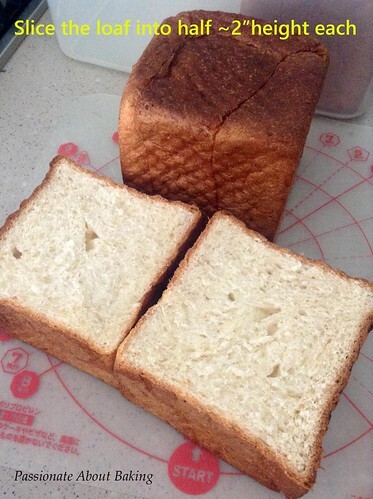 Cut the loaf bread two 2, each about a height of 2". 2. 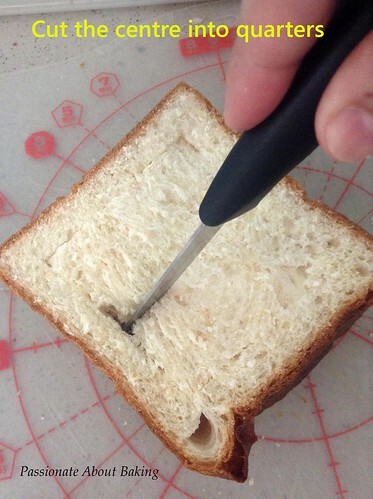 Use a short knife, cut into the bread about 1 cm from the sides. Then cut into quarters into the centre. 3. 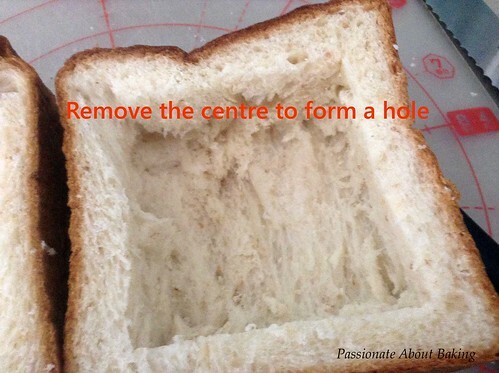 Remove the soft breads to make a hole in the centre. 4. Spread the sides with butter. 5. 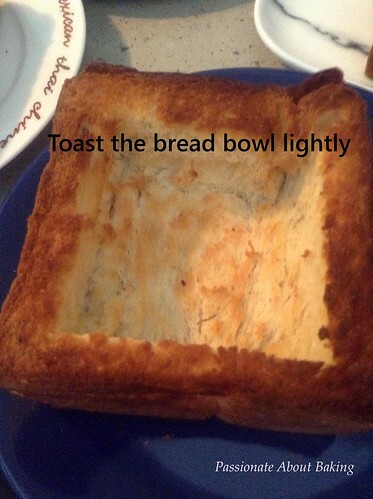 Toast the bread lightly to make it crispy so as to hold the soup. 6. Toast in fan forced oven at 160C for 8 mins. 8. 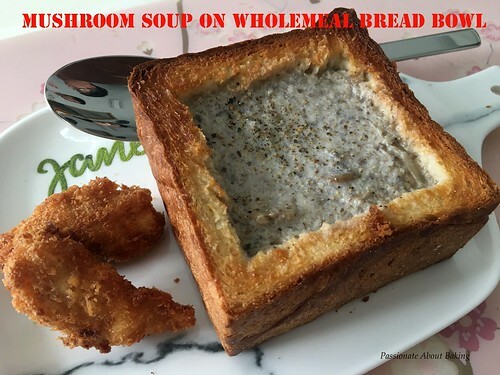 Scoop the mushroom soup directly into the bread bowl. 9. Sprinkle with black pepper and serve.